1. To make the madeleines heat the butter in a small saucepan over a medium heat until melted. Stir in the elderflower and lemon zest, and set aside to cool slightly. 2. Place the sugar and eggs into the bowl of a stand mixer, and whisk on high speed for 6-7 minutes until the mixture is light and thick, and the whisk leaves a trail in the mixture that takes 3 seconds to disappear. 3. Combine the flour and baking powder in a small bowl, then sieve into the egg mixture. Use a metal spoon or a flexible spatula to fold in the dry ingredients until all the flour is mixed in. 5. Grease a 12-hole madeleine tin liberally with butter (I use my fingers to make sure all the crevices are covered), lightly dust with plain flour and place into the freezer to chill. Meanwhile, preheat the oven to 200°C, gas mark 6. 6. Spoon 1 heaped teaspoon of batter into each hole. The mixture will spread out as it bakes, so you don’t need to fill the mould. 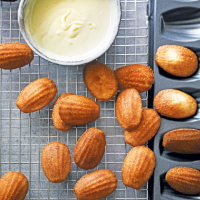 Bake for 8-10 minutes until the middle has risen into a classic hump and the madeleines are springy to the touch. Remove to a cooling rack and repeat with the remaining mix to make 24. 7. For the sauce, pour the double cream into a small pan and heat until just starting to steam. Remove from the heat and add the white chocolate. Stir until smooth. Mix in the cordial and lemon zest, then pour the sauce into a warm bowl and serve alongside the madeleines as a dip. This recipe was first published in Thu Mar 23 16:13:00 GMT 2017.